These are seven farm based AD facilities in SW Scotland. The equipment was supplied by Greenfinch.The digesters were procured and are owned by the Scottish Executive. 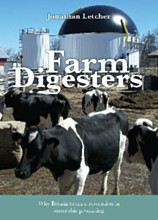 Each of these dairy farms has its own digester and gas collection equipment. They were installed in 2004 in order to provide research into solutions to water pollution problems from farm run off, and a source of useful by-products for the farmers. They were procured, and are owned by the Scottish Executive. Cattle slurry/ manure from the farm, no material is imported.
" A highly readable book which is contains a wealth of information and provides in-depth analysis of AD Plant ownership for the small to average size farmer."